Happy birthday Vera B. Williams (A Chair for My Mother, "More More More" Said the Baby). Pride and Prejudice by Jane Austen is first published in the United Kingdom in 1813. Read the mind-bending Pride and Prejudice and Zombies, by Jane Austen and Seth Grahame-Smith. In 1855 the first locomotive runs from the Atlantic Ocean to the Pacific Ocean on the Panama Railway. Read Trains by Lynn Curlee. In 1958 the Lego Company patents the design of its Lego bricks, still compatible with the bricks produced today. It’s National Kazoo Day. Read Ella Kazoo Will Not Brush Her Hair by Lee Fox, illustrated by Jennifer Plecas. Today marks the birthday of Jackson Pollock, the American painter born in 1912 in Cody, Wyoming. Killed in an automobile accident in 1956, Pollock struggled with alcoholism and depression and has been the subject of hundreds of adult studies, biographies, and movies. Given his lifestyle, he does not seem a natural subject for a picture book for the six to ten set. 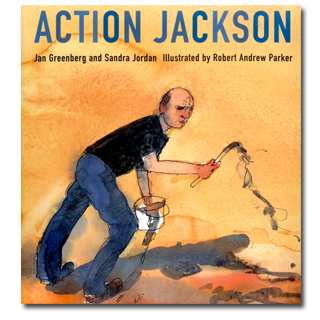 Jan Greenberg and Sandra Jordan’s Action Jackson demonstrates how great narrative nonfiction writers for children can take an unlikely subject and make it fascinating. They do so, in part, by focusing on the process Pollock used to create his artwork. Process is something that children can understand — because they themselves enjoy creating art. An excellent bibliography, footnotes, and source notes round out this volume, illustrated with the vigorous watercolors of Robert Andrew Parker. In them Pollock dances and swoops and fashions his art with energy and passion. Sandra Jordan worked for many years as a children’s book editor. While at Farrar Straus and Giroux she published a book by Jan Greenburg, who taught art appreciation to children. The two became friends. When Sandra left publishing to create her own books, they began their collaboration. Both do extensive research. They argue through the fine points of the text. Both have a passion for getting details right and still telling a compelling story. In the case of Action Jackson, they had written the story about another painting—only to discover while the book was being vetted that this canvass had not been created in Jackson’s barn, even though many eyewitness accounts claimed so. They went back and redid the text to make it accurate. Sometimes a Greenberg/Jordan text can undergo forty to fifty revisions. The results, however, are well worth it. You can trust their books—for the accuracy and child-centered approach. Not only will children get educated about art and the creative process, but adults using this book will also learn a lot as well. Originally posted January 28, 2011. Updated for . I am so appreciative of books that are their own artful masterpiece, yet are about other artful masterpieces. 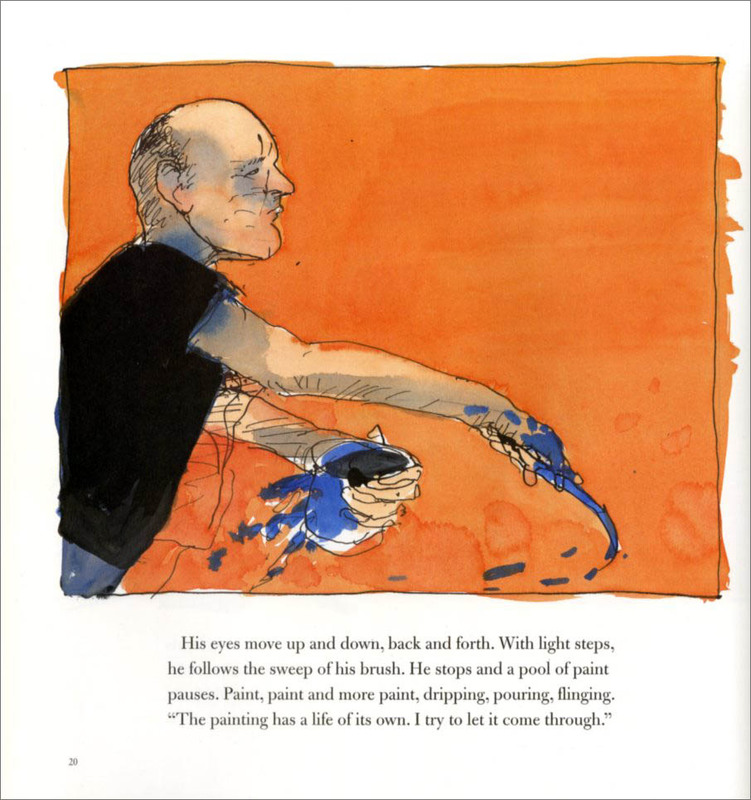 Jordan & Greenberg’s text, accompanied by Parker’s illustrations, do not mimic Jackson Pollock’s style, yet they are in sync with his style. Parker’s watercolors are a great contrast to Pollock’s intense oil/house paint/whatever else he might have been using. (And Ballet for Martha was one of my favorite books from 2010 – incredible art about other art!) I agree that there’s much for adults to learn and appreciate in their books, as well as children. It’s wonderful to learn that this book details the process and time that went into making those Pollock’s pieces. (two months?! I had no idea!) It seems like a perfect text to teach the devotion an artist makes to each stroke no matter how haphazard a piece may seem. ooh, can’t wait to look for this book on our shelves! And how wonderful that the accuracy was extreme–kids deserve the best!! I took a number of art history courses during my undergraduate education, so I have a lot of appreciation for artists. I love that Jackson Pollock is the subject of this picture book because he isn’t one of the artists that young children would necessarily know, though his work is very recognizable. One of my library courses this semester is Information Sources for Children and we have spent these first few weeks discussing “information picture storybooks” like this one. This book has a great narrative, while serving the purpose of an information book. The language is lovely, which isn’t always true of nonfiction writing for children. I believe this book would appeal to a range of audiences because young listeners may enjoy the story as a standalone, while older readers and even adults can appreciate the paratext and source notes at the back. I especially love all of the quotes from Pollock and people who knew him. Maybe I’ll bring this one as an example to my class next week!